FirstBank Makes Ski Mask Joke. Oh, How Gauche! Colorado's FirstBank hopes to nail younger customers by pushing its mobile banking product. "Its simple goal is to demonstrate a commitment to the youth market, by going to them where they are," the pressie explained. But we suspect the choice of media buy -- just Colorado ski resorts -- had as much to do with TDA Advertising's one-hit wonder of a slogan as the demo did. 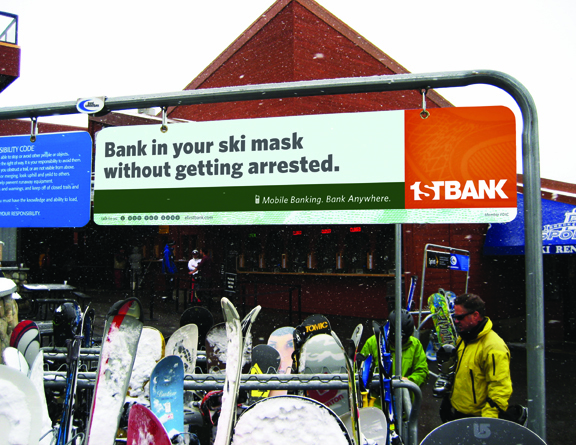 "Bank in your ski mask without getting arrested," the ads deadpan. Yeah, that's not gonna work in a shopping mall.